With a little bit of moulding and change of emphasis in certain areas of O Riada’s commentary a general agreement can be arrived at. The very first track sets the scene - two jigs called here Shandon Bells and Tom Friel’s (named, presumably, for the late proprietor, along with Maisie, his late wife, both unmatchable hosts of music and musicians for many years in their pub in Miltown Malbay). An easy pace is established so that individual musical phrases can be savoured and their knitting together appreciated. The playing is thus focussed on melodic line, with an occasional pre-note flick or tipping on two buttons for rhythmic emphasis. A characteristic double-noting on crochets - turning them into quavers - emerges (there is one track, Track Thirteen, where Mary trebles on the note) which pushes each tune along. Ornaments as a clear device other than those mentioned here are almost entirely absent. With ornaments, in fact, this is the case throughout the CD and when they do appear they are the more neatly diverting - the long note at the beginning of the second eight bars of Track Four and, again, in the second playing of the first part of the first tune of Track Seven, as instances…or would you call these variants? Similarly, Mary rarely plays ‘true’ variants of phrases - though they are detectable in Track Four, Track Eight - second half of the third tune (see below); and in the first few bars of the second playing of the barn dance which Mary calls Pearl O'Shaughnessy’s on Track Eleven. I have to say that it’s a personal delight to have Pearl’s name associated with the tune. I recall being much impressed by the fiddle-playing of her son, Paul, in Kilmihil in the early 1980s - and he has, of course, achieved a popular status which is rightfully applied since then - but only much later came knowingly across the fons et origins in Dublin a lady who has graced musical activity with modesty, encouragement and dependability for many years. Incidentally, the tune appeared, as played by Paul, in The Donegal Fiddlers Summer School Music Tutor Volume 2 under the editorship of Caoimhin MacAoidh (no date but pitched somewhere in the early 1990s, I think). Further, as pointed out in the notes here, Pearl herself played in the all-woman group Macalla and the tune can be found on Macalla 2 though there it’s simply named as a barn dance (Gael Linn CEF122, 1987 - is it really that long ago?). Further still, Gerry Harrington and Eoghan O’Sullivan, whose music the editor has taken a shine to, play it on their CD, The Smoky Chimney (Spin CD 1001, recorded 1996), got via fiddler Maire O’Keeffe from Pearl; and the notes accompanying their CD suggest that, though it’s in four parts, in Donegal you might find it played as two separate tunes. That may just be confirmed by the playing of James Byrne who has the first part, in outline, on his LP, The Road to Glendalough (Claddagh CC52, 1989) and he names it as McConnell’s, referring to Alec and Mickey McConnell, uncles of John Doherty. Well - there, as they say, you go. All this as a kind of emphasising how a tune can still be attached to one person and how, in one way, that one person's influence, then, may be made demonstrable but, at the same time, without diminishing that influence in any way, how wary we should be. Briefly, returning to the first track as example, we also hear Geraldine Cotter’s piano accompaniment and, as throughout the CD, it is set a tad distant. There are one or two doubts about its contribution (below) but, overall, there is a sensitive and interesting appreciation of role. For example, Geraldine sometimes elects to play in an octave above the concertina’s which has the effect of almost dramatising the resultant ‘deeper’ sound (Tracks One and Three, for example). Whilst I’m at it, I’ve always shuddered at the use of accidentals in Irish music. I don’t believe them to be either essential or even native to melodic impulse. They are something of a facile device and they change the face of the music, however restrained in usage. Here, Geraldine uses them in, say, the third and fourth bars of the second part of the second opening jig; in Track Five; and in Track Eleven; but I’d maintain that they’re alien - even as, admittedly, they have assumed a regularity in appearance and something of respectability over a number of years. Their ‘better’ application, to my mind, may be gauged in Track Six, an unspectacular but very satisfying rendering of The Golden Eagle hornpipe - I’ve always believed this to be a ‘composed’ tune from Northumbria (happy to be disabused) and the feel of it, then, and in any case, is just a little different to the norms of traditional music. As ever, and in spite of my own tentative objections, it has to be said that Geraldine’s backing in this track is unobtrusive, but delicately underlines the movement of the tune. As usual too the playing pace is unhurried with, as it happens, smooth not dotted quavers. All the time during the course of the CD’s progress attention is drawn with great clarity and effectiveness to the innate nature of each tune. Of course this also works to benefit the stature of the musician. It is (as Peadar O Riada indicated) to do with fundamental emotions, if you like, rather than the merely skilful use of techniques. In my books it’s a model - in the same way that the playing of Lucy Farr is. Lucy’s re-iterated refrain is that of what she calls ‘timing‘, that consistent and unforced rhythmic impulse that wholly subsumes tiny changes from the familiar (the variant or ornament) - and, in turn, they do not draw salacious praise on themselves but, in reflection, serve to enhance the progress and structure of the tune. Consequently, each tune lingers in the memory. In this connection, for instance, Mary gives a good account of An Paistin Fionn (Track Three) in two forms, encouraged by near-local renderings, as a song from Tom Lenihan and as a fiddle tune from Joan Hanrahan - who called it Statia Donnelly’s. Now…what goes round…is this Statia Donnelly the same lady as the grandmother who was influential in the musical education of Jimmy Power (see Irish Music from The Favourite, LED2051 Stereo, c.1973)? One for Reg Hall, maybe? And Track Five, Tommy Coen’s and John Naughton’s reels, further encapsulate the kind and quality of playing, the first tune assuming almost a trotting gait with some off-beat tipping of notes independent of the melodic line itself during which an image of some smooth, relaxed set-dancing springs to mind (as opposed to a perfectly acceptable more energetic form the point is to draw attention to the former possibility which does seem, sometimes, to be neglected). 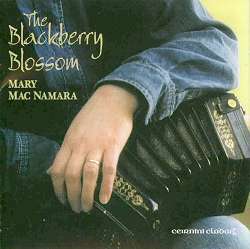 Track Fourteen, Blackberry Blossom and Sandy Carty’s reels, have a sort of caressing approach as opposed to a more familiar spiky concertina sound, with interesting keys, a long note at the beginning of the second eight bars of the first tune, more ‘accompanying’ tipping, a very isolated first few notes at the beginning of the second tune and a second half in it of palpable starkness. There is, it goes almost without saying, nothing hurried or forced in this playing. Track Thirteen, Spailpin Fanach and The Little Beggarman, is quite a courageous choice since both tunes have been so often played and so badly. The inspiration for the first seems to have been from Mary’s father who sang it to the family whilst teaching them to dance in the kitchen. The second is associated here with Willie Clancy. Again, then, the local or geographically contiguous flavour is emphasised. The playing is delicate and discreet with some individual phrasing in the second part of the first tune and a great lift at the introduction of the second. There are a few variants of phrasing in the second tune too.…A last deep note adds humour. Track Eight, Paddy Kelly’s reel, is, I believe, a particularly useful example of Mary’s overall approach. As she says herself, it lends itself to the concertina and here there’s a gentle swing and a relatively plain, rhythmic progression with the aforesaid techniques in evidence to provide particularly satisfying music. Over and above focussed musical ability, nights spent in Tulla and Feakle are inevitably recalled with many of the personalities vividly brought to mind - I can’t divorce the second tune on Track Four (jigs), called here The House in the Glen, from association with Pat Mullins, a fiddler of extraordinary accomplishment and knowledge in depth of repertoire associated with the area, particularly with the great bands of Tulla and Kilfenora, and from further afield. He was regularly introducing new tunes to the company, which included Mary, a couple of years ago and this tune here was a current favourite which his wife, Nancy, would, sometimes, modestly join in with. It is she, too, one night during the same period in Ennis, who I remember being swept up into a set which was breathtaking in its vibrancy - to the music, incidentally, of Andrew MacNamara, Mary’s brother and of Geraldine Cotter. I might quibble about the use here of slight echo in Tracks Three, Four and Fifteen since it adds nothing really to the impact of the tunes but I can see the wish to vary the sound produced which, in contrast, Track Six does with close-miking. My uneasiness is marginal! The doubled concertina used on Tracks Seven (The Hundred Pipers and The Mouse in the Cupboard) and Twelve (Woman of the House and the Green Groves of Erin) is another device to create a different palate (on a piece of plastic, after all). More importantly, in the latter two tunes - and there is a slight echo here, by the way - is the ‘dark’ key of the first tune, pointed out by David J Taylor in his notes as (possibly) an idea favoured by East Clare musicians familiar to which we may add the more particular style of attack including a quite sharp change to the second tune which tune I would call old-fashioned and comfortable. In other words, the playing, not the studio enhancing is the salient factor. One other niggle…The final track, Fifteen, does not at first, I think, quite match the quality of the rest as a flute is introduced as a double-tracking - no name so one might assume that it’s played by Mary. The steadiness of the tune just slips towards ponderousness. The instruments, concertina, flute and piano do not absolutely gel. However, I do believe that the quality of the first tune, named as Mick Hand’s but attributed to the Galway musician Paddy Kelly (whose music is familiar to Lucy Farr, as an instance…see Paddy Kelly also above, Track Eight), begins to rescue the track and, gradually, a more complete shape and integration is assumed. Incidentally, yet another stalwart’s name emerges here, that of Mick Hand himself, a flute player whose experience with groups and individuals such as the Kelly family and the McEvoys in Dublin and, way back, in other contexts now approaches true longevity and Mick’s quality of playing brooks no argument a great servant to music is appropriately invoked. When the second tune in this set, The Maids of Mount Cisco, arrives, a real elegance is found and the flute rests more easily. New angles to the tune emerge - quite unlike those that one might be more familiar with in West Clare, say, as played in Gleeson’s of a Sunday night for set dancing. The point, as always on this CD, is how, in its own particular way, this CD is so valuable. It is the music that emerges triumphant - and in this triumph so, clearly, does the musician. Incidentally, the accompanying notes are not quite accurate here. Breathnach does not favour the spelling ‘Kisco’ but has both alternatives in his index, whilst the tune title on the page is Gearrchaile Shliabh Cisco and the ‘C’ is not, in Irish, pronounced as a ‘K’. However, there is much recent discussion as to the genesis of this tune with ‘Kisco’ in New York as a reference…most of us, at least the elderly, would probably favour The Cisco Kid as a point of contact; and San is not pronounced Fran-Kisco, is it? Take your pick. The repertoire, as a whole and as indicated above, is local in character. Some tunes will, naturally, be familiar from elsewhere but the mark of what is held to be that easy-going East Clare style of playing is everywhere. A litany of names can be found whose contribution is acknowledged - from the immediate localities Joe Bane, P J Hayes, Bill Malley, John Naughton, Mikey Donoghue and the intoxicating and unpredictable Martin Rochford; from a small distance away Pat O’Connor, Paddy Murphy and ‘Junior’ Crehan; from the outer world, as contemporaries to (not necessarily of) Mary, Catherine McEvoy, Jackie Small, Martin Hayes and Charlie Piggott (last time I was in Tulla, over a period during 1997-1998, Charlie was hosting a regular session on Sunday nights). A family atmosphere is maintained. More particularly, the music that these characters supplied has been successfully moulded in Mary’s hands in a distinctive manner. By the way I’d recommend the entry on the concertina in Fintan Vallely’s The Companion to Irish Traditional Music, published but last year, where the term ‘concertina dialect’ conveniently sums up the relationships amongst individuals and how current playing can be set against past endeavour. It points up contributions such as Mary’s. A word more about J David Taylor’s notes. I’ve indicated elsewhere how valuable this background information can be especially if incorporates knowledgeable observation. You can’t complain about David’s groundwork, especially where printed versions are concerned as, for example, he rightly cites the inevitable O’Neill and also Brendan Breathnach’s unparalleled modern contribution to the canon, continuing under the auspices of Jackie Small (who is cited here as a compiler and editor and who has been instrumental, with Hugh Shields, in producing a volume of James Goodman tunes recently) but he also acknowledges one or two others - Bulmer and Sharpley, for instance, and Geraldine Cotter herself, who are worth investigating…in the former case, probably anew. There are a number of anecdotes to enliven the notes as well. I could wish, however, that some contextual matter concerning the concertina itself in its current state of being in Clare - after all, the country most associated with concertinas - had been offered. Apart from the ridiculously talented players who swarm into the Willie Clancy enclave each year - and welcome - there are a number of players who, week in and week out or more sporadically, can be heard in pubs all over Clare and doubtless elsewhere. I think immediately of Gerard Commane, who, with Sonny Murray, recently issued a CD through Comhaltas, of Tommy McCarthy and of the wonderfully fluid player, Yvonne Griffin… The contrast of styles alone would fill a book or a few CDs. Finally, in terms of the quality of playing on this CD, then, the late John Kelly’s words echo here (another Clare man, of course, though long time domiciled in Dublin) as he sought to draw attention to the ‘character’ (he pronounced it as ‘cher-ack-ter’) of each tune which Mary here successfully highlights in so many of the tracks. I’d add that, in this way, the character of a whole aspect of traditions flowers equally. In terms of the naming of names such as that of Pearl O’Shaughnessy and John Kelly, this CD does also have the effect of recalling so many people and experiences and revealing what is something of that family atmosphere noted above as the intimate session has a habit of doing. It isn’t just cosy tunes are brought in, exposed, savoured, comparisons introduced with another’s approach or another tune; tunes are worked on, passed on - perhaps dropped - a history and a making enjoyed, the very stuff of culture without pretension. Whatever - and forgive the wamberlings…I was trying to suggest just how musical circles in Ireland can operate, sometimes unbeknownst to the current participants - my colours are truly nailed. I find this CD to be a thoroughly engaging example of musical ability and mood which, above all, it is really heartening to say, as Peadar O Riada does, represents a living tradition. If you acquire it and like it don’t hesitate to get hold also of Mary’s first CD for Claddagh (CC60, 1994 - with notes by Jackie Small). 1. See my review of Micho Russell as Ireland’s Whistling Ambassador where Bill Ochs does a particularly good job.